The 2011 Newbery Medal was awarded this morning along with four Honor books. Here are this year's most distinguished contributions to American literature for children and, after digging up some details online, here are my initial reactions. Turtle in Paradise by Jennifer L. Holm - I'm all for any book set in Key West as well as books with "smart and tough" girl main characters who hang out with "ragtag boy cousins." I'm looking forward to reading this one. One Crazy Summer by Rita Williams-Garcia - The initial description of sisters sent to live with the mother who abandoned them doesn't make me overly eager to read it. Reviews say funny (+1), heartbreaking (-1), and unforgettable (+1). That's a +1 overall, with an added "Crazy" in the title, so I guess I'll read it. Heart of a Samurai by Margi Preus - An American ship rescues the crew of a shipwrecked Japanese fishing boat. The main character learns American culture, pans for gold in California, and returns to Japan unwelcome as an outsider. Seems like plenty of action. Dark Emperor and Other Poems of the Night by Joyce Sidman - Sidman's book Red Sings From Treetops won a Caldecott Honor last year, and this year she wins a Newbery Honor, but my favorite is still This Is Just to Say. 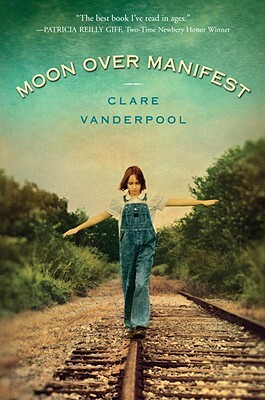 Moon Over Manifest by Clare Vanderpool - From clarevanderpool.com: "Abilene and her friends, Lettie and Ruthanne, embark on an honest to goodness spyhunt that ends up with someone leaving a note on their treehouse cautioning them to Leave Well Enough Alone. But Abilene sets caution aside when she ventures down the mysterious Path to Perdition and ends up at Miss Sadie's Divining Parlor." Best of all, it seems to be a Newbery surprise. I hope both my Amazon order and library hold were placed quick enough to get the book shortly. I haven't read any of them, but then again, this year I hadn't made much of an effort to do so. (Although One Crazy Summer is on my to-be-read pile.) I did follow the pre-award buzz online and noticed that a number of titles receiving a lot of attention were left off the list. Maybe there were some snubs, maybe not, but I do know I like surprises. And based on my recollection, Moon Over Manifest qualifies as a surprise.